A new NIH grant establishes a national research consortium focused on improving the diagnosis and understanding the cause for Dementia with Lewy Bodies (DLB). The multi-center study, led by principal investigator James Leverenz, M.D., of Cleveland Clinic and (former UW ADRC researcher), is aimed at finding DLB biomarkers, which can assist with diagnosis, detect disease progression, and ultimately measure response to treatment. 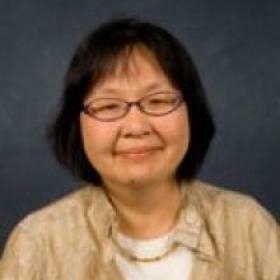 Dr. Debby Tsuang, co-investigator in the UW ADRC Clinical Core, runs the DLB Consortium Study site at the VA Puget Sound Health Care Center/University of Washington, one of the nine participating clinical centers. Why do we need a DLB biomarker? Dementia with Lewy Bodies, the second most common form of neurodegenerative dementia in the elderly, describes patients whose earliest symptoms include a decline in thinking abilities, often accompanied by visual hallucinations and a sleep problems, and who later develop Parkinson’s disease symptoms such as tremor. When the brains of these patients are examined, they show Lewy bodies, or tangles of alphasynuclein, and, over half the time, brain cell changes that are characteristic of Alzheimer’s disease. But here's where it gets confusing, especially for doctors, patients, and families. 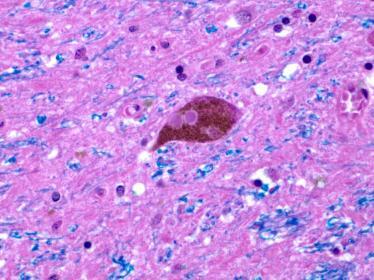 Lewy bodies are also found in some cases of Alzheimer's disease and Parkinson's disease. Patients who first develop the motor symptoms of Parkinson’s disease and develop dementia later in the course of their illness are identified as having Parkinson’s Disease Dementia (PDD). Like patients with Lewy Body dementia, these patients also typically show evidence of Lewy bodies at autopsy, but only a small number of these individuals have significant Alzheimer’s disease pathology. Researchers still don't know if all of these disorders that involve dementia and Lewy bodies are entirely separate diseases, an overlap of multiple diseases, or all the same disease. Dr. Debby Tsuang of the UW ADRC has studied DLB for 25 years. “We're trying to find early disease biomarkers that differentiate between DLB and PDD because, currently, the clinical diagnosis is based only on which symptoms came first.” Biomarkers make it possible not only to provide accurate diagnoses, but also identity which patients would likely respond to emerging targeted therapies. Through this new DLB consortium, researchers from the nine clinical sites will collect clinical information, brain imaging scans and biological samples from more than 200 DLB patients. By collecting clinical data and biofluids (blood and cerebrospinal fluid), the consortium will create the necessary foundation for biomarker development and have a secondary benefit of developing an ongoing subject sample available for additional studies. All samples and data will be deposited in the PD Biomarker Program for use by qualified investigators. The consortium also includes Florida Atlantic University, Thomas Jefferson University, Rush University, University of California San Diego, University of North Carolina, University of Pennsylvania, University of Pittsburgh, and VA Puget Sound Health Care Center/University of Washington. The research team will collaborate with the National Institute of Neurological Disorders and Stroke and the National Institute of Aging, which have established data banks and biorepositories.The consortium will receive additional funding from The Lewy Body Dementia Association (LBDA) to fund an annual meeting of investigators to foster data sharing, collaboration and discovery.